Liberty senior Taylor Karlo, left, takes a swing during Tuesday’s non-league showdown against host Big Walnut. 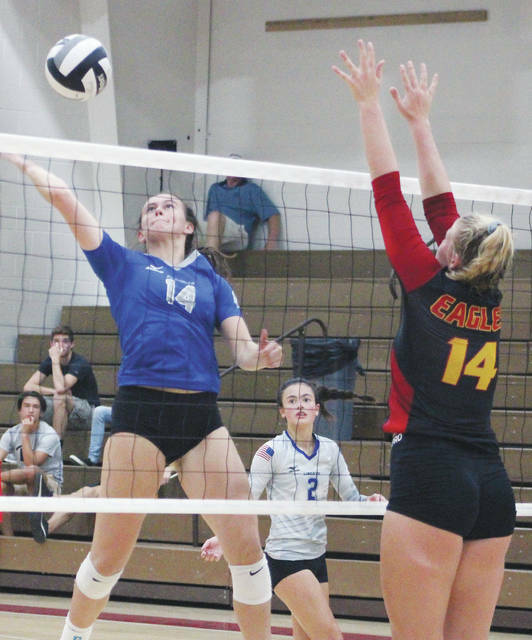 Senior Taylor Karlo didn’t think she was going to get to play this season for the Olentangy Liberty volleyball team. She was diagnosed with autosomal dominate polycystic kidney disease (ADPKD) at the end of the club season in June. ADPKD is a disease where cysts filled with fluid form around the organ, enlarging it … eventually leading to failure. Karlo was cleared to play after getting a second opinion. She was told to avoid hitting her back, which could cause a cyst to rupture. Karlo has been a key contributor on the team since her sophomore year. Still, Chapman worries whenever Karlo lands. Currently, there is no cure for the disease. Karlo is participating in the PKD Foundation’s Walk for PKD Oct. 20. Liberty hosts Olentangy Sep. 25, which will serve as a way to help Karlo fundraise for the walk. To donate, visit Karlo’s Walk for PKD page at https://pkdfoundation.salsalabs.org/centralohiowalk/p/taylorkarlosfundraisingpage/index.html. For more information on the PKD Foundation, visit: https://pkdcure.org.